Confident CAPTCHA is a security tool that serves as an engaging brand advertising platform. So much time and money is wasted on brand advertising through mediums that are largely ignored by consumers. Confident CAPTCHA represents a new, untapped advertising platform where consumers are actively engaged with the medium. Confident Technologies, Inc., the leading provider of image-based authentication and verification solutions today unveiled a new version of its popular image-based CAPTCHA technology, called Confident CAPTCHA™. The new version features the ability for website administrators to easily upload their own branded advertising images and promotional messages to display in the Confident CAPTCHA. Companies can brand the CAPTCHA to match their website’s look and feel, use the space to promote products and services, or earn revenue by allowing other organizations to advertise within the CAPTCHA on their website. In addition to the new brand advertising platform, Confident CAPTCHA version 2.3 also delivers support for international languages including Spanish, German, French, Portuguese and more. The new version also provides an improved audio option for the visually impaired and failover capability. CAPTCHA tests are used on websites to distinguish between legitimate web users and automated computer programs called bots, which spread spam and malicious links, and register fraudulent accounts. CAPTCHAs most often take the form of warped and distorted words that web users are forced to decipher to prove they are human. Such tests frustrate users and increase abandon rates, especially on mobile browsers. More than 280 million CAPTCHAs are solved on the Internet every day – each taking an average of 15 seconds of a web user’s undivided attention to solve. That adds up to more than 1 million hours wasted every day, forcing customers and website visitors to decipher illegible text. In fact, in the amount of time web users spend solving CAPTCHAs over the course of one year, people could have instead built 830 Boeing 747 planes, 270 Eiffel Towers or even The Great Pyramid. More consumer attention is paid to CAPTCHAs annually than during an entire week of primetime coverage of the 2012 Olympics. By using Confident CAPTCHA version 2.3, websites and online businesses can take advantage of all that wasted attention and real estate on a web page, while at the same time improving the user experience and stopping spam and fraudulent registrations. Unlike display ads which are mostly ignored, users must actively participate with Confident CAPTCHA in order to complete the task at hand. Therefore, advertisers know their target consumers are paying attention to and engaging with the brand message. 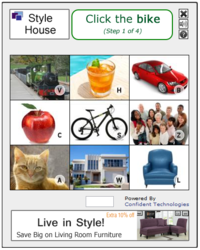 Hundreds of websites currently use Confident CAPTCHA including Embee Mobile and QuikDraw Software. “We’re thrilled to release this new version of our innovative CAPTCHA security software. So much time and money is wasted on brand advertising through mediums that are largely ignored by consumers, including online display ads and television ads. Confident CAPTCHA represents a new, untapped advertising platform where consumers are actively engaged with the medium and guaranteed to be paying attention,” said Curtis Staker, Chief Executive Officer at Confident Technologies. “Businesses should take advantage of the valuable website real estate taken up by traditional CAPTCHAs and instead use Confident CAPTCHA in that space for the perfect balance of security, usability and brand advertising. Confident CAPTCHA is free to use for most websites and is highly customizable. Administrators have the ability to change the Confident CAPTCHA grid size and determine the number of images users must identify, to dial up or dial down security as needed. Easy-to-use libraries and plugins are available for all major programming languages and popular web content management systems. Download Confident CAPTCHA today by visiting: http://www.confidenttechnologies.com/Get_Confident_CAPTCHA. Confident Technologies, Inc. provides intuitive and secure, image-based authentication and verification technologies for websites, and web and mobile applications. Multifactor authentication solutions from Confident Technologies increase security without the need for expensive hardware tokens, smart cards or biometrics and improve user experience through an easy-to-use, image-based interface. For more information, visit http://www.ConfidentTechnologies.com. Copyright 2012 Confident Technologies, Inc. All rights reserved. Confident Technologies is a registered trademark of Confident Technologies, Inc. All other trademarks are property of their respective owners.